Hi Guys. Just wanted to thank you so much for a amazing weekend. Our guide was great and found us the best club any of us have ever been to when our open air club plan was rained off at the last minute. We are already planning to come back and will make sure we tell everyone about you!! !Thanks again for making my hen do truely memorable! Thank you Budapest Hungary. We had a great time and will definitely recommend you to our friends. King Arthur themed banquet style dinner for the group with a FREE welcome drink. 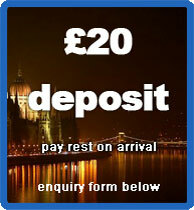 Enjoy the main tourist sights of Budapest with photo stops at various locations in the city. Enjoy local bars and pubs with you own english speaking guide. This is an optional extra. £5 discount per person on the package price if you prefer your hen weekend without one. 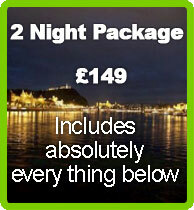 Your package includes entry to thermal spa in Budapest. You can then treat yourself to massages, treatments and more. Great way to chill out on Saturday afternoon. Your english speaking guide will pick you up from the airport, help with accommodation check in and check you into the spa, restaurant and nightclub. Free mobile phone with english speaking operator. If you need anything, call us and we'll sort it there and then. We're Budapest based ! All internal transfers by luxury minibus for your group to activities, clubs and dinner.